Invitation: You are cordially invited to submit your poetry on Mrs. Looney's blog. You are such talented poets. Please share your work! "Let Gratitude radiate wherever you are." Be sure to have your second poem completed and emailed to Mrs. Looney. If you do not have internet access, be sure to hand-write your poem and hand it in to Mrs. Looney before Friday! Please sure that it is completed by this Friday, November 22nd the latest! Homework, Friday, November, 22nd, 2013: Have a fantastic break! Be grateful. Enjoy family. Read. Rest. Explore. Write for yourself. Be outside. Homework for Wednesday, November 13th and Thursday, November 14th: Be working on your gratitude poem that is due on Friday. See below. Students will be working on the Gratitude poem in class each day the week of November 11th. 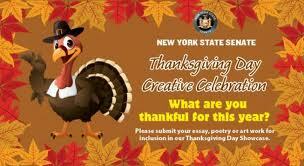 See the description under "New York State Senate Thanksgiving Day Creative Celebration" below for more details. Students are expected to be working on their poems in study hall and at home as well. See Resources below for ideas. The final copy must be completed by Friday, November 15th. Be sure that all spelling is correct. Be sure that you utilize a thesaurus to add sophisticated words to your poem. Spend time brainstorming ideas and details for your "I am Grateful For" poem in your writer's notebook. Senator Catharine M. Young invites us to be creative this Thanksgiving. We have a wonderful opportunity to publish our work on the New York Senate website. Scio's fifth grade and sixth grade students will be submitting poems for the showcase. The fifth and sixth grade students will submit their poetry in writing class. All entries will be sent electronically. The deadline date for entries to the New York State Senate website is November 20, 2013. We plan on uploading the poems by Friday, November 15, 2013.